Retinal damage in diabetes. 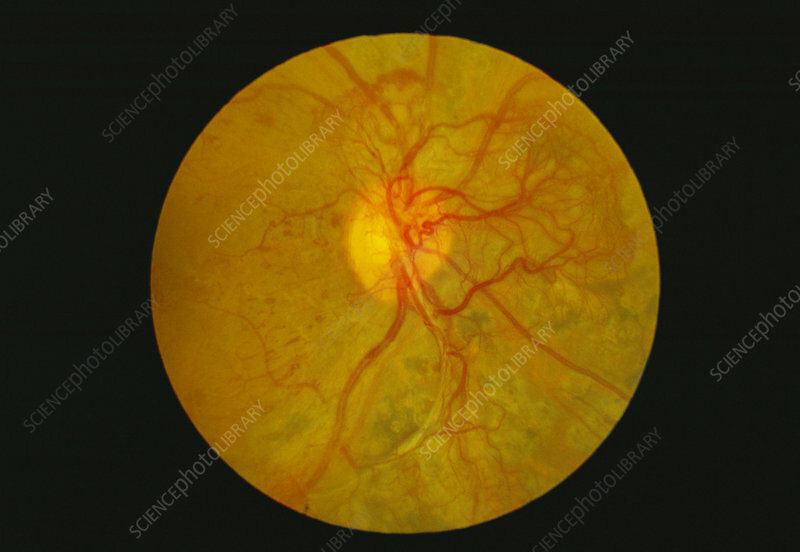 Ophthalmoscope image of diabetic retinopathy, damage to the retina caused by diabetes. Changes to the retinal blood vessels (red) mean that they leak, causing small haemorrhages to form (dark red dots). Circulatory problems lead to the tissue lacking oxygen, and new vessels (thin mesh) develop to try to counteract this. However, these new vessels often haemorrhage themselves. This may lead to floating objects in the visual field, blurred vision, detachment of the retina and glaucoma. It may lead to blindness if untreated. Bleeding can be treated by laser photocoagulation, and blood sugar level maintenance can slow the disease's progress.